The gripping documentary from Belfast based filmmaker Sean Murray will have its pre-release premiere on February 21st before releasing across Northern Ireland. 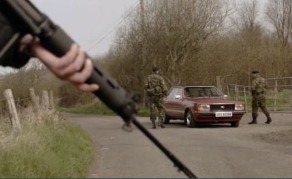 The feature documentary follows the story of the Glennane Gang who were allegedly involved in the murder of over 120 innocent civilians in Counties Tyrone, Armagh and across into the Irish Republic from 1972-1978. The Glenanne Gang included members of the RUC and UDR - one whom, John Weir detailed of a shocking plot ordered by British Intelligence to attack a Roman Catholic primary school. Subsequent literature and investigative work has since unearthed the extent to which the British Government were involved. Years later, after the release of Anne Cadwallader’s best-selling book ‘Lethal Allies’ and and copious amounts of work from human rights groups The Pat Finucane Centre (PFC) and Dublin-based Justice for the Forgotten (JFF), revelations of collusion between the British Government and the loyalist death squads are revealed. Murray has also written and produced the documentary, whilst Oscar-nominated Northern Irish actor Stephen Rea (The Crying Game) narrates the film. Murray will participate in a Q&A after the screening, hosted by Phil Scraton. ‘Unquiet Graves’ is expected to release internationally later in 2019. An Irish release date is expected later this year.